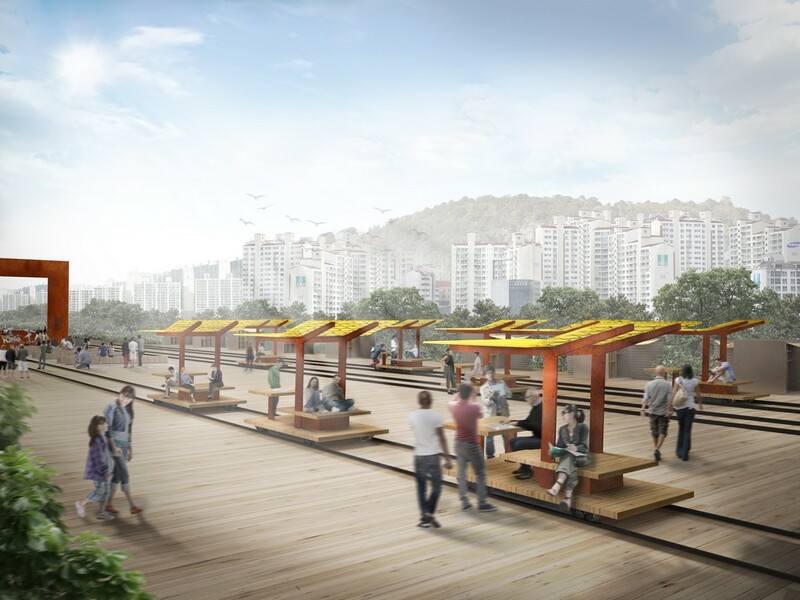 The redevelopment project for a waterfront area running along 5 km of abandoned railway in the city of Busan. Home to 3,5 million inhabitants, Busan is the second most populous city in South Korea and extends along the south-eastern coast of the peninsula. 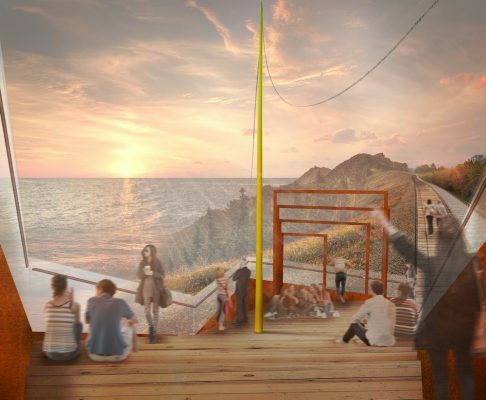 Studio Migliore+Servetto, which has been active in Japan and Korea for a long time, is currently working on a redevelopment project here that spans an area of 5 kilometres of disused railway overlooking the sea, which will give rise to a themed park called the “Blue Line Park”. For the design of this vast area – construction of which will begin in 2019 – the architects worked on different narrative levels in order to provide a new waterfront for the city, and at the same time offer visitors a diverse range of activities that will engage users of different ages and interests. In Migliore+Servetto’s layout, the theme of re-appraising disused spaces is interwoven with that of landscape architecture. On the one hand, the designers took the historical transformations and the local context and territory into account and decided to maintain a link with the long-established character of the area. 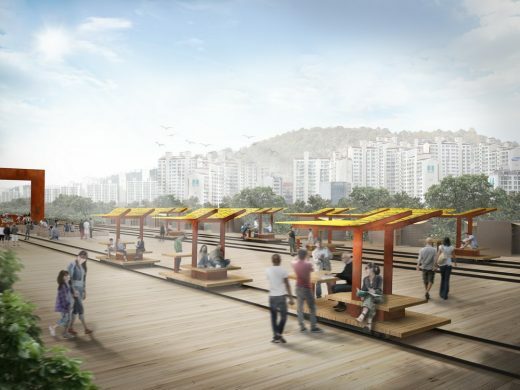 On the other hand, their aim was also to rebuild the relationship between humans and nature, transforming the area into a sort of ﬁlter between the bay of Busan and the surrounding urban fabric. 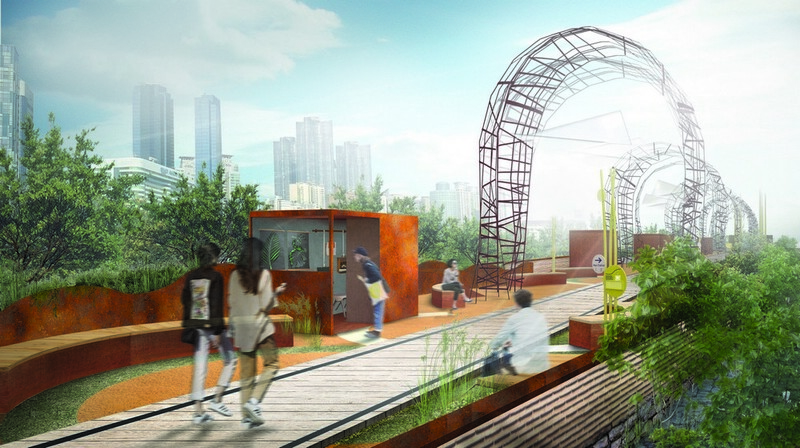 “Blue Line Park” is the place where the city is reconciled with the natural landscape, thanks in part to a targeted use of technology and sound design, as well as a new and fascinating cultural hub for events, concerts and collective activities. The project is part of a strategic territorial action that aims to establish Busan as a meeting point between past and future. 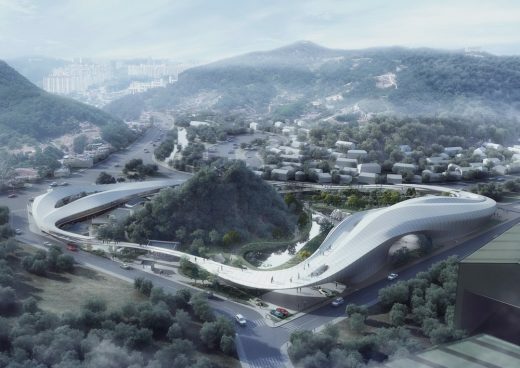 It is true that, following Seoul, the face of the future here seems to coincide with a cuttingedge vision of the city. It is important to remember that Busan is a rare stretch of South Korea that was not affected during the Korean war. As a result, since it was not subject to bombing and destruction, it underwent a less organised transformation than Seoul, and for this reason it is still possible to sample real Korean tradition among the alleys of certain districts, such as in the Chungsapo area, which houses a small port of artisans and ﬁshermen. 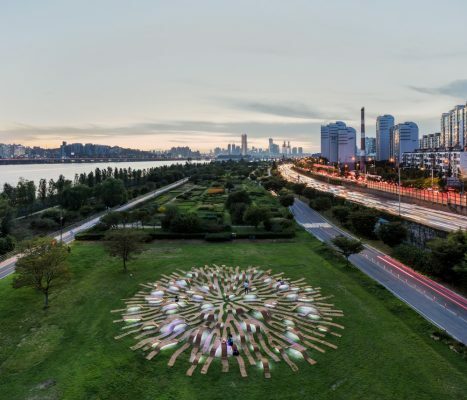 The linear park designed by Migliore+Servetto unfurls over ﬁve kilometres and feature two main entrances, with two new urban squares that serve as a junction with the city. 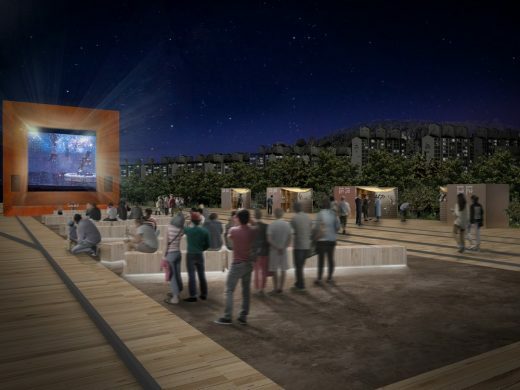 On one side, the narrow side streets of the district, densely packed with artisanal businesses, ﬂow into Mipo Square, while on the other side, the multifunctional space emerges near the old terminal of Songjeong railway station. 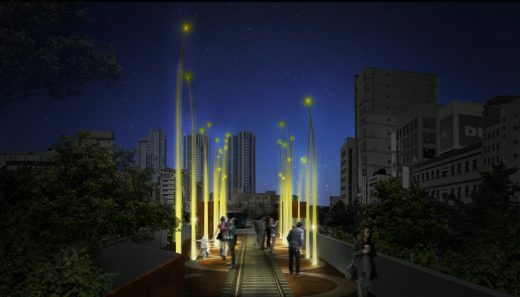 Corresponding to the two access points, thin blades of grass in a bright yellow-green tower up to 10 metres in height, almost as if creating an outsized artiﬁcial version of nature. This structure marks the transition from the urban to the natural environment and introduces visitors to a path punctuated by thematic areas, designed to offer different experiences and named “Islands of Listening, Knowledge and Encounter” by the architects. The “Islands of Listening” are fully ﬂedged sound installations, aimed at connecting visitors with the natural element that surrounds them: the “Wind Installation” entrusts light bamboo rods with the task of restoring the voice of the wind to visitors; “Listen to the Sea” places visitors in dialogue with the marine environment through large ear drums that act as a sounding board for the echo of the sea. 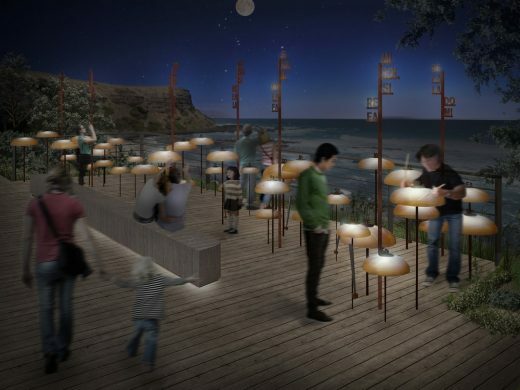 “Play the Symphony” encourages active participation through the creative use of an element from Korean tradition, the typical metal bowls transformed into percussion instruments that can play the entire musical scale. The protagonist of “Listen to the Nature” is the luxuriant nature of the wooded area behind it, as wide corten steel arches invite visitors to stop and listen to all the sounds of the fauna and the surrounding vegetation. In the “Islands of Knowledge”, technology becomes a means of creating awareness of the geographical qualities of the area. Migliore+Servetto shall create moments of rest and knowledge here. 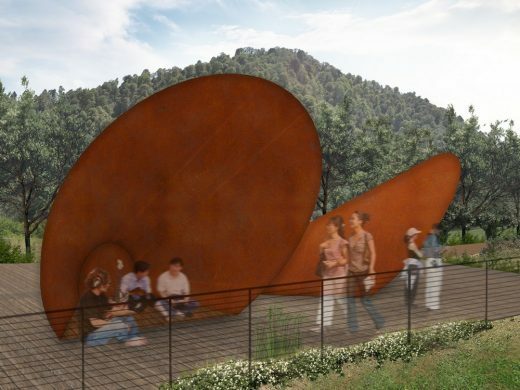 The “Florarium” is a sort of digital library dedicated to the local ﬂora, characterised by long corten steel and wood benches. The “Algae Pavilion” in the heart of the park is an exhibition pavilion, but also an iconic structure that strongly refers to local tradition. Its external covering changes in appearance as the atmospheric conditions change, making a real landmark within the park. 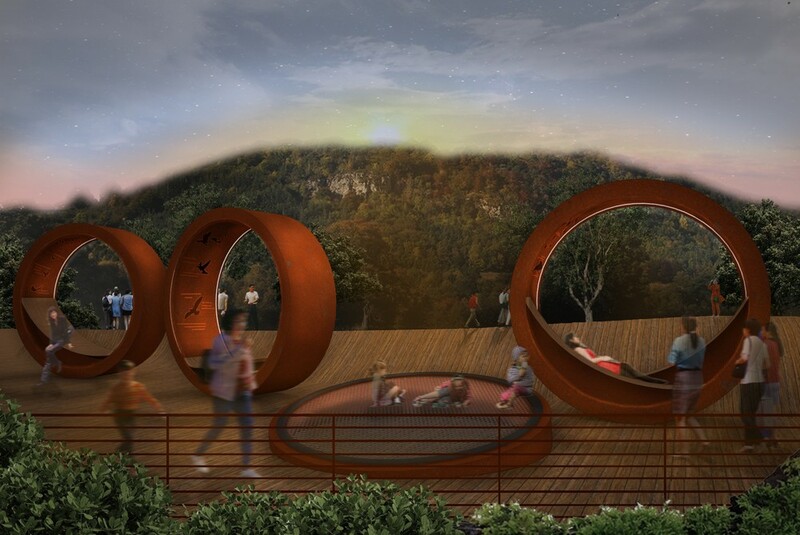 Finally, the “Islands of Encounter” are places designed to accommodate extended moments in which people come together and share, and serve as hubs for activating the park life. 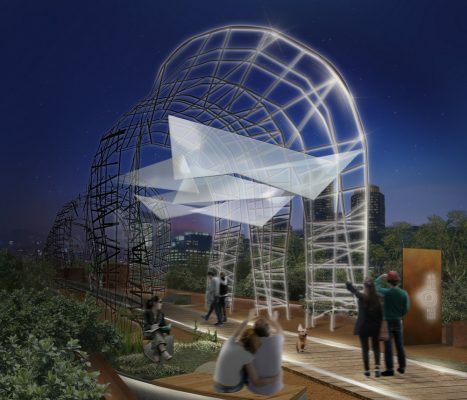 The “Rainbow Tunnel” is an area of transit that can turn into an evocative location for concerts and events, with coloured windows that acting as a ﬁlter for the external landscape, offering a new way of seeing the surrounding nature. 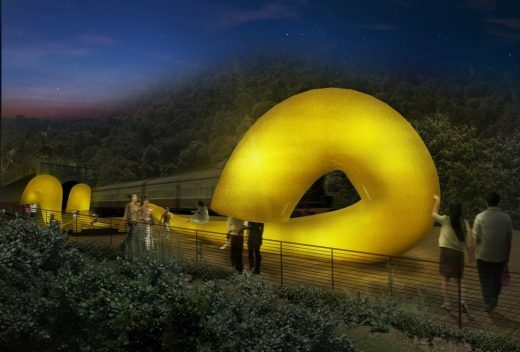 The view of the Bay of Busan acts as a backdrop to the “Boat Theatre”, an open-air theatre situated halfway along the route, whose shape enchantingly evokes the hull of a boat. Offering an additional opportunity for interaction and entertainment, at the end of the pathway there is an extremely permeable scenographic element: the large 9-metre setting of the “Cinema Paradiso”, which frames the old railway and the landscape and can be transformed into a cinema screen or backdrop for theatrical performances as required. 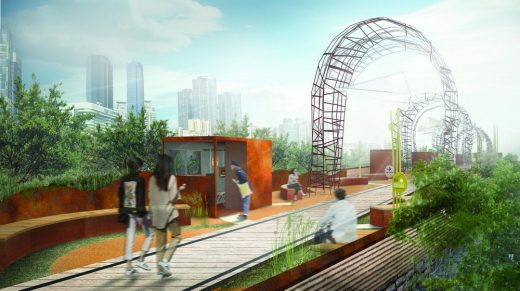 In the context of the new multifunctional space, which is created near the historical Songjeong station, abandoned tracks occupied by mobile platforms recall the old train seats, while simple structures at the side offer local artisans and artists the opportunity to exhibit their products in a sort of outdoor market. 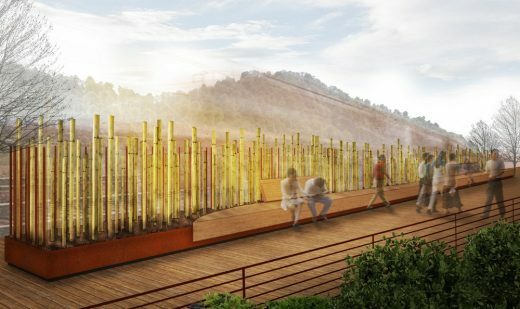 Visitors are thus invited to follow an acoustic park with a linear structure, as they tread a path that interconnects natural splendours with the past and present history of the place. This journey takes is framed within a narrative that offers visitors new perceptions that are always different over time. The line it traces does not only translate back to the old railway tracks, but it also becomes a synthesis, not only between the past of the site and its current form, but also between what the park is and what it could be, a place brought to life through being experienced. Ico Migliore and Mara Servetto are the co-founders of Migliore+Servetto Architects, a global design ﬁrm based in Milan that has been designing space identity projects on various scales for institutions and companies worldwide for over twenty years. 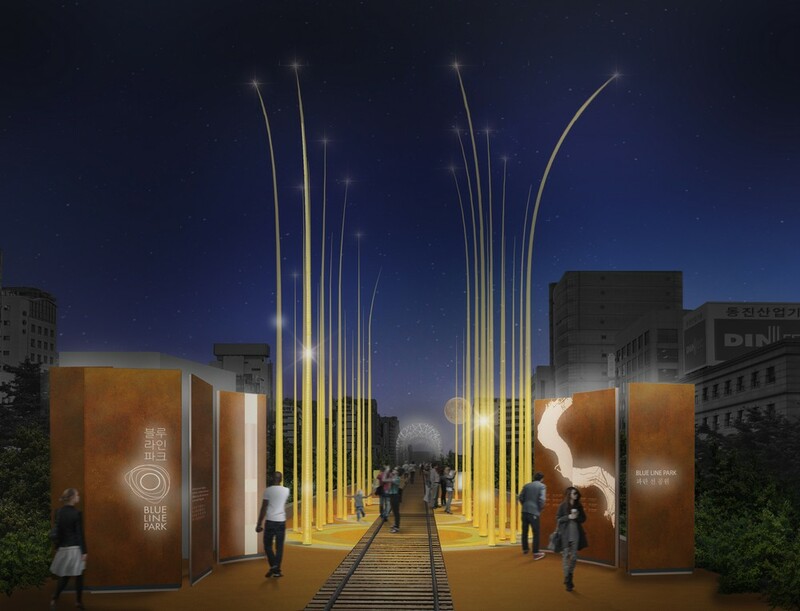 From architecture to retail, museums to installations, urban design to visual identity, their works are characterised by an expressive use of light and new technologies. Their projects have been recognised by several international awards such as three Compasso d’Oro ADI (2018, 2014, 2008), two German Design Award, eleven Red Dot Design Award and two International Design Awards (USA). Ico Migliore is professor at the Politecnico di Milano and both of them are visiting professors in Tokyo (Japan).